Some Saturday's a 4:00AM wake up call is worth it. 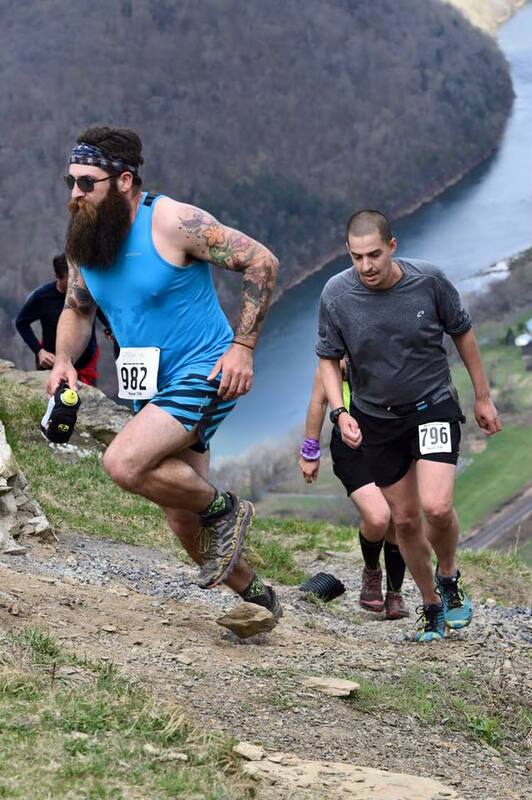 Hyner View Trail Challenge Saturday is one of them. For me this made four in a row. Four years ago it was blustery with flurries, last year it was eighty degrees and sunny. This year conditions were nearly perfect, no rain, a mix of sun and clouds along with a cool breeze. While the weather may be a little different each year, the Pa Trail Races (facebook) community is dependably warm, inviting, and yet beautifully tough like the trails themselves. Although a handful of runners from our local group (Valley Running Club) were on hand for the race, I hit Route 220 South solo this year, and after a 5:00AM departure found myself rolling into Hyner shortly after 7:30 for the 9:00AM start. While I did crank out over 1,100 miles on the spinning bike between late Feb. and early Apr, I only run about 300 miles between Jan. 1st and April 22nd. And despite logging a handful of solid, climb filled 10 to 14 mile runs at World's End State Park and Mt. Pisgah State Park - coupled with recently battling a nasty, lingering chest cold - I wasn't exactly feeling confident in the days leading into Hyner. Maybe it was because of my lackluster training recently (lowering expectations), or perhaps the fact that I've now run a couple dozen races of this type, but I found myself feeling surprisingly at ease as I mingled about near the starting line awaiting the gun. 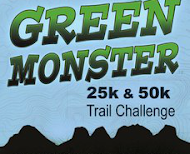 The Hyner View Trail Challenge 25k is roughly divided into two sections. Section 1 is the approximately one mile of asphalt stretching from the start line to the beginning of the cliff hanger trail. Section two is the everything else. With this in mind, the basic strategy of pretty much everyone who signs up is to run like hell for a mile, and then hang on for dear life until crossing the timing mat at the finish. I positioned myself in the mass of humanity as best as I could before the start, and fell in with Josh, a local running friend (who I would spend the rest of the race yo-yo-ing with) at around an 8 minute per mile average pace. Relatively speaking it was kind of a relaxed paces compared to some of my other starts, however for some reason, it was good enough to avoid being brought to a stand still at the cliff hanger trail bottleneck. The pace along cliff hanger was slow but steady, and then came the inevitable climb up 'Humble Hill,' to Hyner View. The climb was surprisingly comfortable. I kept my eyes on the ground and my heart rate low while Josh and I chatted about craft beer and home brewing for distraction. Eventually wepopped out of the trees and into the open where a crowd of cheering spectators had gathered near the first aid station. 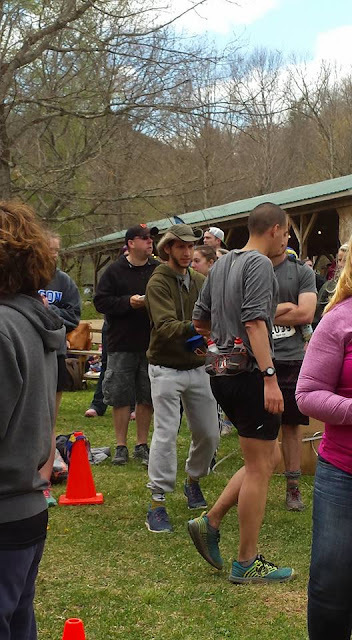 I cruised through the aid station without stopping, leaving Josh, and began the steep descent. Josh re-passed me half way down. As I was climbing well and running strong on the few flats, but having trouble on the descents, we would periodically encounter each other throughout the day. Reaching the bottom (miles 4-6) was a relief, and subsisting on water, one Hammer Gel per hour, and one Hammer Anti-Fatigue Cap per hour, I found myself running strong through a surprisingly dry Johnson's Run (miles 6-9). This section of multiple creek crossings is typically a long, wet, gradual uphill grind, but for the first time in four years it was completely feasible to make it through with dry feet (without going out of your way to do it). The low water levels were certainly a contributing factor keeping the pace up in route to next major climb. I continued to climb well late in the race, and while the Garby Trail is always tough, I've felt far worse at this point. This year my feet were dry, the temperature was ideal, and despite consuming only a couple hundred calories (two gels), my energy was as good as can be expected. Despite some slight cramping on the last push up S.O.B, I caught Josh again at the top. At the final aid station I refilled my bottles, had a volunteer spray cold water over my head, grabbed a handful of pretzel bites and found the legs to run the flats in route to the long descent of Huff Run. The eventual winner of the 50k race (Michael Daigeaun / 4:32) overtook me as I left the open field and ducked back into the mountain laurel along Spring Trail. 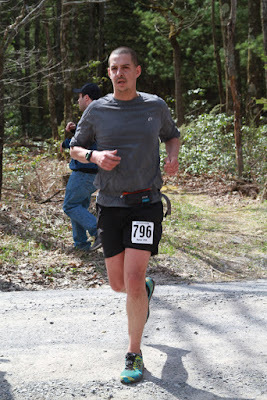 Last year's 50k winner, fellow Bradford County runner, and old course record holder Adam Russell passed me at the road crossing at the top of the descent. To put things in perspective, when he set the old course record last year he didn't pass me until the Route 120 bridge, a quarter mile from the finish. This year I still had a little over two miles to go. As with the other two big descents of the day, the bone jarring drop down Huff Run back to the asphalt was unpleasant for me. I periodically stepped aside to let faster runners pass, and as much as I typically loath road running, I was quite glad to finally reach blacktop. 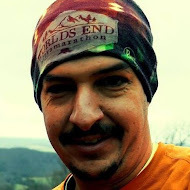 I cruised across the bridge at a steady 9:20 pace, veered right on to the dirt road, power-hiked Hyner's classic final little uphill and crossed the finish running.